Now, what would you expect the average payout to be each time you open these cases? It’s very difficult for the average person to tell. That’s because there are certain “ultra rare” items that everyone is looking to open, which are worth a lot of money. If you open one hundred cases and you get a ST Karambit Fade FN on your last case, it will be the difference between a terrible return and an amazing return. Still, you’d expect the average return on investment (ROI) for these cases to be somewhere in the neighbourhood of what you spent. Maybe not 100%, but you would expect it to compare to other games of chance. Perhaps 90-95% return on investment on average, like many casino games (Roulette, Blackjack, etc.). Well, you’ll be surprised to hear just how low the returns actually are for all Cases in CSGO. In this research paper written by Michael Leddy, the author collects thousands of data points for each case opening to calculate a very reliable average ROI for each case. To calculate the average return on investment, you just take the average ROI for each different type of case you open. 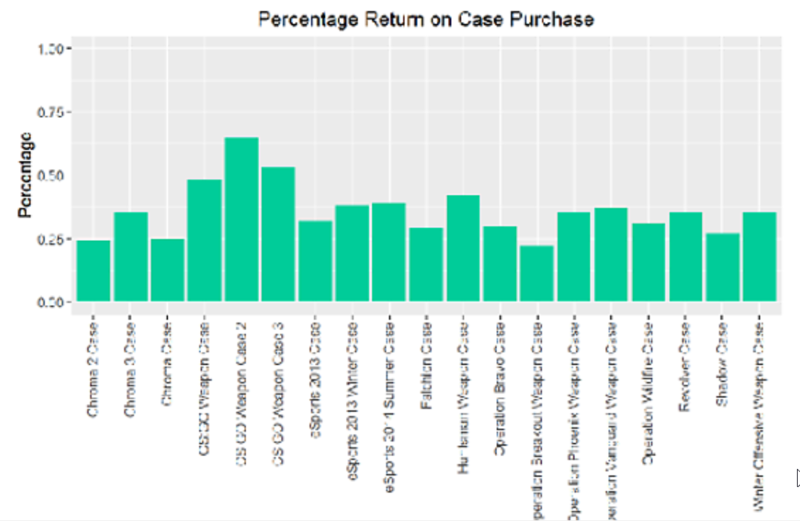 Of all the cases available, the one which produces the best return on investment is the CSGO Weapon Case 2 at around 66%. That means if you spend $100 to open Weapon Case 2 cases, you can expect to earn about $66. Not great. But it gets much worse. Chroma 2 and Chroma Cases have an expected ROI of just under 25%! That’s terrible. You should only expect to get about 25% market value from your investment. On average you can expect to earn around 35-40% on each case you open in CSGO. Only expect to make half your money back on CSGO Weapon Case 2 and 3. Long story short, it makes much more sense to buy CSGO Skins directly than to risk your money opening cases. If you like the thrill, it’s better to take your money to a local casino where you can earn over 90%! This gets even worse when you realize you can buy CSGO Skins BELOW Market Prices on third party websites like https://r2pleasent.com. So you can buy a Skin that costs $10 for about $8-9 USD. As for case opening sites, expect their payouts to be just as bad, possibly worse than the Steam official cases. These sites rarely ever reveal their payout ratios, and have every reason to pay out as little as possible. Beware advertised payout ratios, unless you can see solid proof of their legitimacy. In conclusion, so long as you understand the expected payout ratio, then opening cases is fine. Some people are willing to pay extra for entertainment, and opening cases can be entertaining. But some people truly expect to make a profit by opening cases, and that’s just the wrong way to think. All cases have a negative expected value (EV). If you want the best bang for your buck, it’s always better to just buy a skin directly.